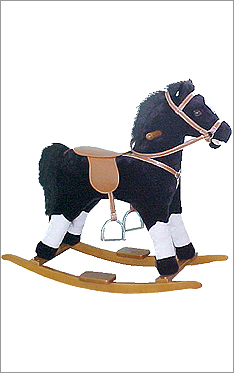 Small black and white pinto plush rocking horse with sound effects - for ages 3 and up - very strong frame, able to hold 180 pounds, colors may vary slightly from picture. Sounds include galloping and whinnying - uses 2 "AA" batteries. 29" x 12" x 24"